(Nanowerk Spotlight) How often have you crumpled a sheet of paper in frustration and thrown it into the bin without further thought? You'll be amazed to hear that researchers – inspired by a trash can full of crumpled-up papers – have now applied this to solving one of the challenges of scaling up production of graphene sheets. One of the fascinating properties of crumpled paper balls is their strain-hardening effect – the harder you compress them, the stiffer they become, due to the formation of folded ridges that increase the strength. A similar effect has now been found in crumpled graphene balls. A major problem in scaling up production of graphene is the tendency of individual graphene sheets to aggregate due to strong van der Waals attraction. Restacking of sheets not only reduces their solution processability, but also compromises their properties such as accessible surface area. Researchers at Northwestern University have now developed a new form of graphene that does not stack. The new material is made by crumpling the graphene sheets into balls. These crumpled particles exhibits strain-hardening behaviors, thus making them remarkable resistant to aggregation in both solution and dried states. "Sheet-like graphene particles tend to stack into piles, which makes them less useful and harder to process," Jiaxing Huang, Morris E. Fine Junior Professor in Materials and Manufacturing at Northwestern University, tells Nanowerk. "When you crumple them like paper balls, the graphene powders do not aggregate no matter how you process them: heating, washing, drying, and even pelletizing under high pressure. This also makes them recyclable." As the researchers describe in their paper in the October 13, 2011 online edition (Just Accepted Manuscripts) of ACS Nano ("Compression and Aggregation-resistant Particles of Crumpled Soft Sheets"), their results were achieved without degrading the electrical properties of the bulk material. From a basic science point of view, the researchers use mechanical deformation to induce a 2D to 3D dimensional transition. "This creates a structure that always has unfavorable/frustrated van der Waals attraction either in solution or in dried – or even compressed – state", says Jiayan Luo, a graduate student in Huang's research group and a lead author of the paper. "This is why they don't aggregate." In terms of applications, the crumpled particles (still in the sub-micron range) should help to standardize the graphene materials by delivering stable surface areas. Huang explains that the balls can stack up into a tight structure. "You can crumple them as hard as you want, but their surface area won't be eliminated, unlike face-to-face stacking." To make crumpled graphene balls, Huang and his team created freely suspended water droplets containing graphene-based sheets, then used a carrier gas to blow the aerosol droplets through a furnace. "As the water quickly evaporated, the thin sheets were compressed by capillary force into near-spherical particles," says Hee Dong Jang, another lead author of the paper, who has returned to Korea from Northwestern to be a Distinguished Principal Researcher in the Korea Institute of Geoscience and Mineral Resources (KIGAM). "The size of the crumpled particles and the degree of crumpling can be tuned by the concentration of graphene oxide in the aerosol droplets." The resulting crumpled graphene particles have the same electrical properties as the flat sheets but are more useful for applications that require large amounts of the material. Huang collaborated with Zhen He, Assistant Professor in the Department of Civil Engineering & Mechanics at University of Wisconsin-Milwaukee to construct microbial fuel cells made with graphene-modified anodes. Indeed, they found that the crumpled graphene balls outperform the regular sheet-like graphene in electricity generation. "Compared to the commonly used anode modifiers such as activated carbon, crumpled graphene particles can offer many advantages because they provide not only high electron conductivity and high accessible surface area in solution, but also allow rapid mass transfer of the fuels and ions due to their open structure," says He. "In addition, they pack into a solid with rough surface, which can facilitate microbial diffusion and colonization." 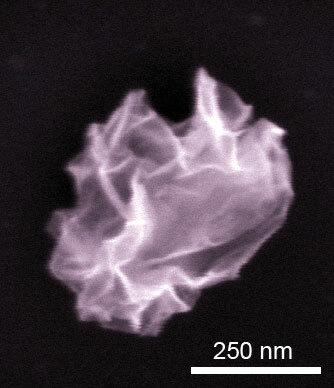 "Particles of crumpled sheets are a new type of ultrafine particles," says Huang. "They have an alternative set of rules governing their synthesis, structure and properties. Therefore, they could also serve a model system to explore a new set of processing-structure-properties relationship of ultrafine particles."